Origin: Sonoran Desert from the Arizona desert foothills north of Phoenix south through Sonora, Mexico into the Mexican state of Sinaloa. Landscape Use: Xeriscape, accent, rock garden, barrier, specimen. Form & Character: Stout, fixed, rigid, arborescent, dry. 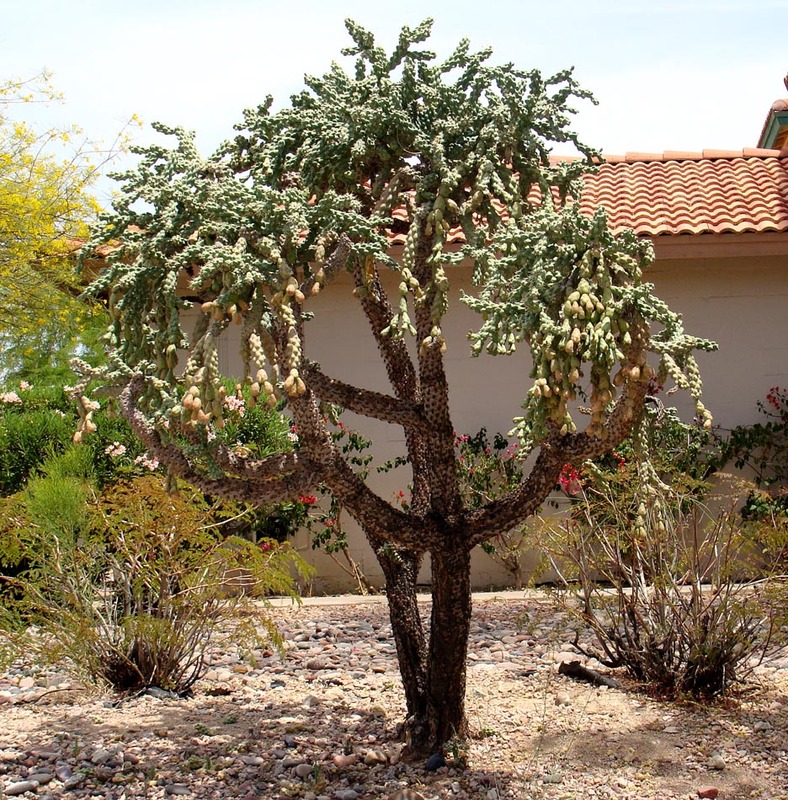 Growth Habit: Branching cacti with cylindrical, jointed stems (not pad forming) to 8 to 10 feet in height with a near equal spread. Stems and fruiting chains are pendulous. Foliage/texture: Stem joints about 5 inches long, light green with knotty ridges, aeorles on knotty stems ridges sparsely cloaked with 1 inch yellow spines; coarse texture. Flowers & fruits: Flowers magenta purple to 1.5 inches across, fruit fleshy and persistent. The key with this cholla is that The fruits are persistent and the fruit areoles keep producing more flowers, in turn producing more fruits. 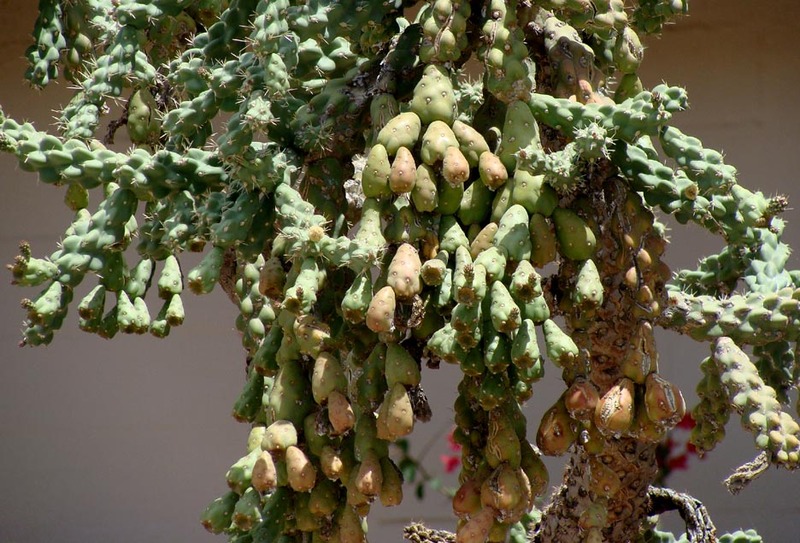 The end result is chains of fruit that give this cactus its name and chain fruit like appearance. Seasonal color: None, as flowers of chainfruit cholla are not as showy as other as other cacti. Soil: Well-drained soil is required especially if used in an irrigated urban setting. Watering: Very little supplemental water to establish and none once established. Pruning: None except to rarely reduce overall numbers and density of stems. Propagation: Seed rare, more common is the easy rooting of detached joints. 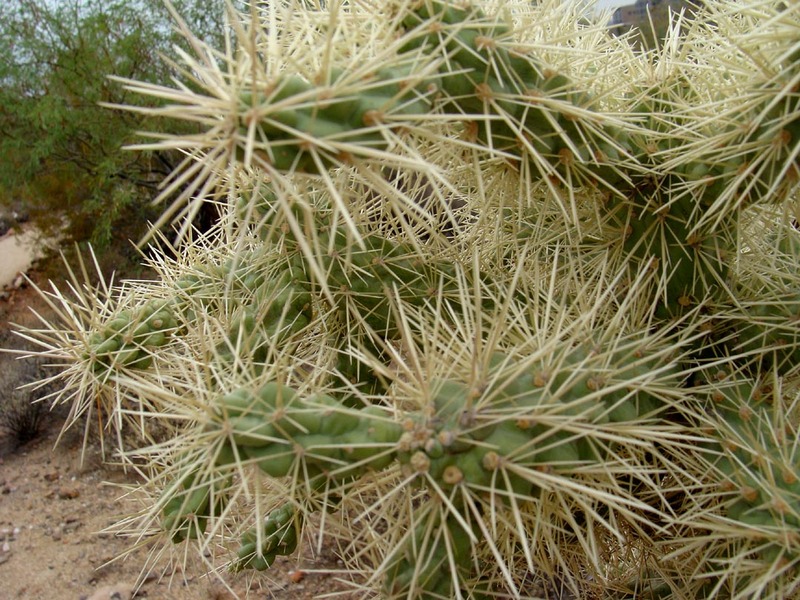 Additional comments: Chain fruit cholla is a 'work-man' like cholla in amenity landscapes. Fruiting pattern is intersting, otherwise this cholla is lacking the visual and textural accent of other realted Opuntia and Cylindropuntia species. Recently, the genus Opunita was taxonomically re-organized. Many references will never-the-less still incorrectly refer to chollas as belonging to the genus Opuntia, rather than Cylindropuntia.